Years ago, when I was a young food scientist working in product development for Kellogg, the company introduced a ‘clean desk’ policy. Before the new policy I was happy to be the most messy person in the department. Life was good except I could never find what I was looking for. After the new policy, my boss started to ‘remind’ me constantly to change my ways. It’s never a good idea to have your boss on your case, so I chose the lesser of two evils and started putting away my things at the end of every day. I ended up loving having a clean desk. It made coming to work much more pleasant. It helped me think clearer. And I could find things quickly when I needed them. It took a while but over time this policy spread into other areas of my life. Including of course my kitchen! If I was only going to give you one rule this would be it. I can’t stress enough how having less equipment in your cupboards and less ingredients in your fridge and pantry makes is so much easier to feel organized. This is a huge topic on its own but the first place to start is just being mindful of what you bring into the kitchen. The next step is to clear out and review what you have. Any out-of-date ingredients or equipment you haven’t used in months should go. If you’re struggling with letting things go, do what I do and create a ‘things to donate to charity box’. Keep this in your garage (or shed). Having this step makes it easier because you can change your mind if you find you are actually missing that hot dog warmer or popcorn maker. I find it best to keep similar items together. For example I have one cupboard for plates, another for mugs, another for pots, another for cleaning supplies etc. 3. Keep things where you use them most. Easy access makes being in the kitchen a smoother experience so you’ll want to spend more time there! For example, I keep salt and pepper on our dining table so they’re always there when we eat. And I have salt and pepper in the pantry for seasoning when I’m cooking. Other examples are keeping a jar with utensils next to the stove so they’re easy to grab when I’m cooking. And I have my knives on a rack on the wall in the middle of the kitchen so they’re within arms reach. One of the worst feelings is walking into a dirty kitchen and having to spend precious time cleaning before you can even start cooking. I’m afraid that apart from getting a cleaning robot or a live-in maid, the only way to avoid this is to have a personal rule to clean on an ongoing basis. If you find yourself with a minute to spare, ask yourself ‘what can I clean now?’ It can take a while to build this habit but you’ll never regret it. This is a trick I picked up from Gretchen Reuben in her brilliant book ‘The Happiness Project’. Whenever you see something that could be put away or cleaned, say to yourself ‘do it now’ and follow through. This really worked for me so now I automatically pick things up and put them away. I’ve saved this for last because after golden rule No. 1, simplify, habits are the next biggest game changer. By building habits you put being organized on autopilot. It becomes automatic – something you don’t have to think about. This is HUGE because you get the benefits of feeling in control and ‘on top of it’ without having to think or try too hard. prepping ingredients on the weekend or whenever I can (usually when I’m already in the kitchen). My 6 ‘golden rules’ which really help me be organized in the kitchen (and other areas of life). I’ve really been getting into flavour pairings lately inspired by a fab book, The Flavour Thesaurus by Nikki Segnet. It’s hard to go past salty crispy bacon and cool creamy avocado as an match made in heaven. 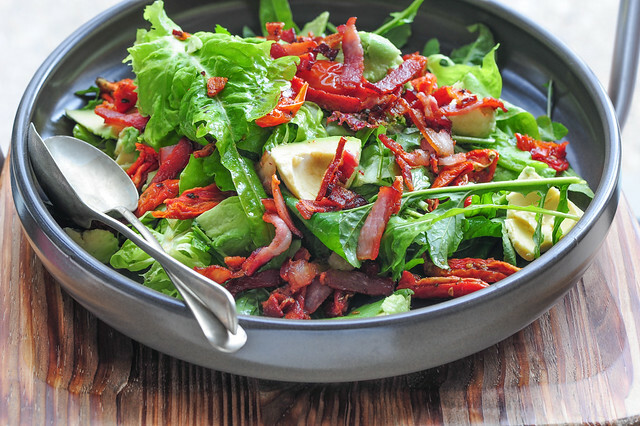 I love this salad because the bacon and avo make it nice and filling yet it’s still fresh and bright. Perfect for lunches or brunches. 1. Heat a little oil in a frying pan and cook bacon on a medium high heat until crispy. 2. Combine vinegar with 3 tablespoons extra virgin olive oil in a large bowl. Season. 3. Toss leaves in the dressing. 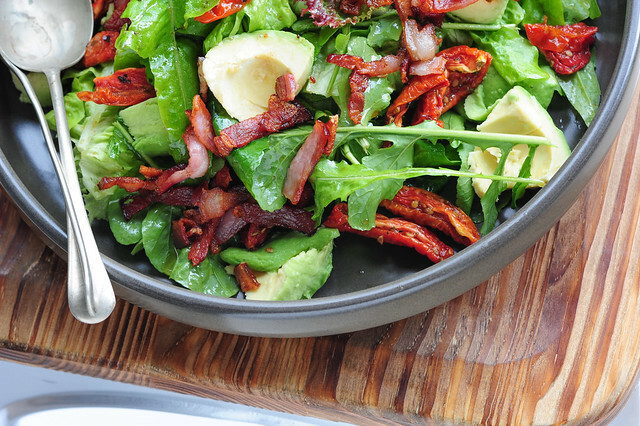 Sprinkle over chunks of avocado, tomatoes and the hot crunchy bacon before serving. vegan – replace bacon with sliced grilled or roast mushrooms. vegetarian – skip the bacon and serve with a poached or boiled egg on top. more substantial / carb-lovers – toss in a drained can of white beans such as cannellini or butter beans to warm up in the bacon fat and add to the salad. You could also just toss in torn sourdough. no semi dried tomatoes? – replace with halved fresh cherry tomatoes instead. more veg – add chopped raw veg like snowpeas to the salad. If you’re able to at some point I’d be interested in knowing what kitchen equipment/utensils you’d consider essential in keeping in line with your “simplify” rule. I follow a food philosophy similar to yours of eating wholefoods but it’s easy to get caught up in buying every new gadget to make cooking easier and end up with a cluttered kitchen. For example is that spiralizer essential or can I get the same result with a utensil I already have like a peeler? Thanks for the great tips! Building habits is the hardest to master, but makes such a difference. One habit I read about years ago has been a great help to me. Before beginning to cook a meal or project, I fill one side of my sink up with soapy water. That way, if I have to reuse a measuring cup, utensil, etc. I can easily wash, rinse, and reuse. Also, I can toss things into the water and keep food from getting caked-on. And it makes post-cooking cleanup a snap. No excuses not to do the dishes right away! I was really glad to see you mention the Flavor Thesaurus again. I bought a copy on your recommendation, and the other night I used it to figure out what I wanted to do with your Stuffed Sweet Potato recipe. The result was pretty spectacular. I don’t use the book often, but it really helps me when I need it.